It was just a short while ago that I learned how to do Rubber Stamp Conditioning to get them to produce crisper and better images, although I have been using Rubber Stamps for many years in my Scrapbook Layouts and Cards. More often than not, when I would use a rubber stamp, I would be disappointed in the image. I didn't have many problems with the stamps that were basically lines, but the ones that had large areas of solid or background, the images just wouldn't be crisp or completely filled in. 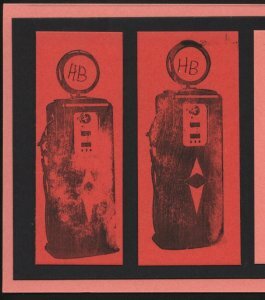 Here is an example of two images of an old fashioned gas pump that I got with the unmounted rubber stamp set from the Club Scrap Cruisin' Kit from August 2008. A lot of filled in area on these stamps, but the images were just not clear. I could tell what it was supposed to be, but the outcome was disappointing. I used a stamping mat under the paper and was very careful about pressing all over the image. Well, the second one was better than the first. Was the key to practice first on some scrap paper? That was only a partial solution to what I learned later was that I needed to do Rubber Stamp Conditioning. These images below of an old 45 rpm record had the same problem, but they got crisper the more times I stamped the image. I did some research and found that, like most manufactured items, there is apparently some residue on the face of the stamp, that keeps the ink from evenly covering the image.To better show off your purchased images you need to do some Rubber Stamp Conditioning. First - You can try what I accidentally discovered, stamp the image repeatedly on scratch paper until it looks crisper. You may also try twisting the stamp a little on the paper. As you wipe off the ink, you will also be wiping off some of that manufacturing residue. Try stamping again. 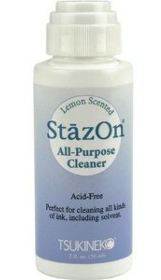 Second - You can clean your stamp with a stamp cleaner like Staz-On, all purpose stamp cleaner. Staz-On is actually made for cleaning the ink off your stamps after using them, but it is also great for conditioning rubber stamps as it will clean off that residue. It comes in a small 2 oz bottle with an foam applicator top that is just rubbed across the face of the stamp. Wash this off, perhaps even use an old toothbrush or nail brush to get the stamp good and clean. If you don't have any Staz-On yet, just try some soapy water and a soft brush. Or you can purchase some at the Scrapbook-Advice Rubber Stamp Store - look for the Category that says Stamp Cleaners at the Rubber Stamp Store. After cleaning, hold the stamp up to the light. If you see some glossy areas, clean again. Third - Clean the stamp with an eraser. Rub with a large eraser on the rubber side of the stamp. Look at the stamp and see if any of the large areas seem to be glossy. These are probably the areas that are not holding the ink well. Rough these up a little with the eraser. Apply ink to the stamp and check to see if the ink is separating on this area of the stamp, much like water beads up on a waxed car. Forth - Clean the stamp with a sanding block. This actually does the same thing as the eraser, but it's a little quicker. And, no, you will not hurt your stamp. If you need one, they are available in the Scrapbook-advice.com Rubber Stamp Store under the category Sanding Blocks in the Rubber Stamp Store. My favorite is this white one, with a cushion inside. It's about 3 1/2 inches long and about 1 inch square. Scrapbook-Advice.com Tip: You may also be able to pick up one of these cheaper at a drug store in the aisle that handles nail supplies. possible images with your stamps. Go to Rubber Stamping for all sorts of information related to stamps.